The Big Wobble: The USGS claim explosion caused by a meteorite exploded with enough force to register as a magnitude-2.0 earthquake over New Haven Michigan last night! The USGS claim explosion caused by a meteorite exploded with enough force to register as a magnitude-2.0 earthquake over New Haven Michigan last night! The US Geological Survey confirmed that a meteorite had exploded in the sky near New Haven, Michigan, about 40 miles northeast of Detroit, on Tuesday night. The USGS said the explosion caused enough force to register as a magnitude-2.0 earthquake. 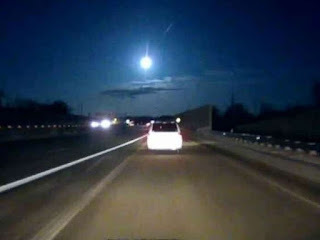 Video posted on social media Tuesday night shows drivers witnessing a flying rock that emitted a bright light in the night sky before disintegrating. Some videos showed it appearing to head straight toward some vehicles driving on a freeway before it disappeared. Detroit NBC affiliate WDIV reported receiving "hundreds of calls" from viewers around 8:15 p.m. local time to report the phenomenon. The meteor was seen across the region in places such as Ohio, Michigan and Ontario at about 8 p.m. local time and registered a 2.0 magnitude tremor about 4 miles (7 km) east of Saint Clair Shores in Eastern Michigan, the United States Geological Survey said on its website. The National Weather Service (NWS) confirmed it was not a meteorological event but more likely a meteor.